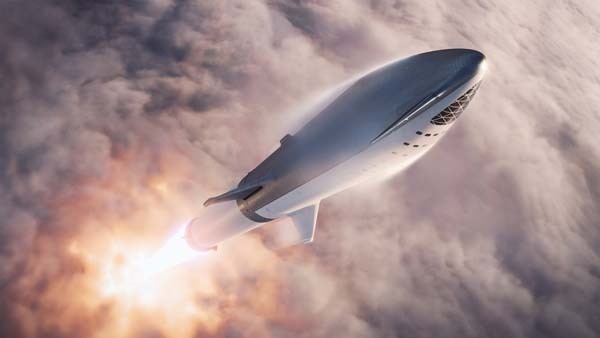 Elon Musk and SpaceX have tweeted some new artist conceptions of the BFR in flight. Musk tweeted that there is now a “forward moving wing” near the nose. 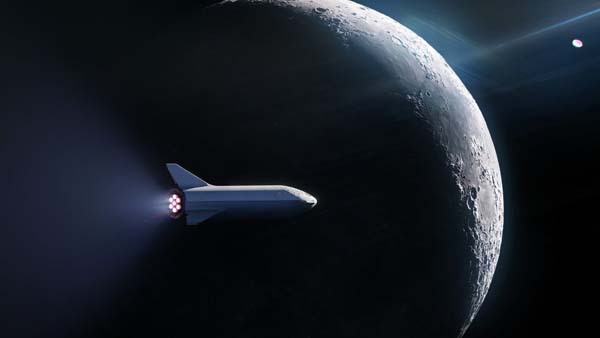 The announcement of the first passenger signed for a trip around the moon aboard BFR will be webcast tonight at 9 p.m. EDT (6 p.m. PDT) from SpaceX headquarters in Hawthorne, Calif.
Where’s the center of pressure on that configuration? Yay, in-line Shuttle, all things old are become new again! I believe that one of the reasons for the variable canard will be to manage center of pressure versus center of mass at the beginnings and endings of flights. Old things new is right! The last Methalox launch I’ve heard of is the one by Winkler and friends, in 1935, in Germany, on the Baltic coast. BFR has always seemed rooted in the 1930’s, not only to developments on the Baltic Sea at the time, but also Hollywood basements. Who needs a center of pressure when you have 31 Raptors? We believe that this was the first LOX-methane flight. Do you have any details on the Winkler launch? X-20 had some radical model rocket style fins on the bottom of the Titan III that was going to launch that vehicle. Up ’till now, SX has been going forward with a propulsive solution to controls for the BFS. This is somewhat a radical change and a departure from that. Given the stability problems you observe for BFR, SX is avoiding the “Standard Missile” solution to the problem of having forward drag sources by going forward with the assertion that the propulsion system will deal with instability. I expect gridfins on the bottom of BFR at some point. Remember, those model rocket fins came before we KNEW about the Whitcomb Area Rule. That’s how old Dynasoar is, and how little we knew about super(or hyper)sonic flight! Yes. Why does it seem SpaceX is recreating the NASA design studies just in the 2010s? Even the artwork for Mars trips seems familiar. Heck, the implied “here’s the artwork, just send funding” request seems familiar too! It’s crazy what we did not know then. F1 had an even number of combustion subcells in the injector plate! I just watched the Musk live presentation. Lots of interesting information. The forward cabin volume is larger than BFS Version 2017. The central fin has nothing to do with directional stability and control, and serves as a symmetric location for the third landing strut. Version 2017 had six landing struts. The two lower fins are variable geometry, which very much remind me of how the folding outer wing panels of the XB-70 Valkyrie moved. BFS engines are now seven of the sea level versions of Raptor, which reduces payload down to 100t but also provide extra volume at the base of the vehicle for a dozen cargo racks. Putting some of the cargo mass in the tail will certainly ease cargo handling at the destination, and might also improve CG for touchdown as well. Version two BFS might remove two cargo racks to substitute a vacuum nozzle version of the Raptor for each sea level version. Musk claims the new seven engine configuration can work with up to four engines out. Took a while for me to find the reference. On October 6th, 1932, the HW-2, paid for by Huckel and built by Johannes Winkler, was launched no more than 10 feet above the sand of the beach near the harbor of Pillau in East Prussia (Now called Baltiysk under Russian ownership). This is from the history by Willy Ley, Rockets, Missiles, and Men in Space, 1968, paperback edition, page 183. It was only 10 feet, and the vehicle could not even be salvaged, but it was as much a launch as some of the early launches in the Thor program, which through its Delta Family descendants just finished its last orbital launch this past weekend. After that test, Huckel provided no more money, and Winkler eventually ended up building small rocket engines for the Luftwaffe. Right, show me a NASA shuttle replacement design created after 2010…. NASA has long given up on reusability since the start of Constellation, that was the beginning of the end for NASA human spaceflight. Yes, NASA knows it’s impossible to make rockets reusable like airplanes. Why don’t everyone accept that and just give up? This is the third iteration of this design and I personally expect it to evolve more in the future. This is not at all like the shuttle which was locked into a compromised design very early on. Also, they’re not mixing crew and cargo. 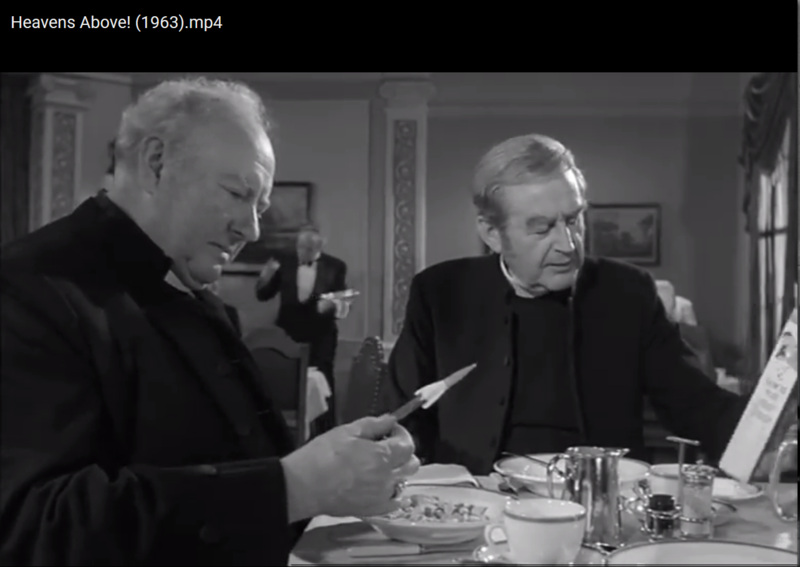 What was shown was the crewed version. There will also be a tanker version and a cargo version. This is not at all like the “one size fits all” shuttle design which mixed NASA and DOD requirements into one vehicle that had to be all things to all people (F-35 anyone?). As has been seen with Falcon 9, SpaceX isn’t afraid to iterate the design in fairly fundamental ways. V1.0 of Falcon 9 was going for parachute recovery of the first stage (not propulsive landing) and had early versions of Merlin in a square configuration. The latest Block 5 version of Falcon 9 has many, many changes when compared to V1.0. By comparison, the shuttle configuration changed very little over the years. I watched it live last night. Musk, as usual, fumbles over words at times. He’s clearly not the best public speaker. But he at least tries to provide answers to questions. He seemed to be particularly excited to answer the question concerning the removal of the vacuum Raptor engines from the BFS. Most reporters wouldn’t even know what to look for when it comes to engine changes like that, let alone know how to phrase the question. 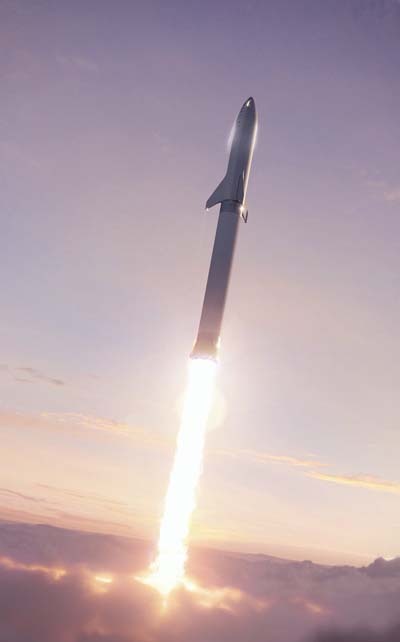 With the new forward fins on BFR, I propose a new nickname for it… “The Squid”. Yes, thank goodness for Tim Dodd asking a decent question. Especially in light of that clueless reporter asking a question that had been answered immediately before! That it looks like a squid was exactly my thought too. As squids are cool, especially giant squids 😀 , I think it’s awesome! The best thing that can happen is for NASA to stop working on Human Spaceflight from planetary surface to space and back. They should be working on getting us on the moon and mars. Russia, Europe, ULA, and possibly China have done exactly that. Yes, the L.A. Times beclowned itself once again. That is, among other reasons, why I dropped my subscription some years ago. If that is supposed to take 50-100 ppl to Mars, as is, it is a horrible mistake. They need to add real living quarters, such as a BA-2100. The BA-2100 would be lightweight and much cheaper than BFS. Having 1-2 of those would allow for lifeboat duties as well, which would NOT be a bad thing. Or even better, on the technology to explore and develop the Moon, Mars and the rest of the Solar System and just let SpaceX handle the job of deliverying it to its destination. SpaceX, BO, and other privates should be doing the delivery to orbits. Ideally, they would land as well, but lets see what Musk/Bezo do. Hopefully, they will drive the industry to compete.